High conductivity hermetic thru vias are fabricated in ceramic dielectric materials; primarily alumina 99%, alumina 96%, and aluminum nitride. These ceramic substrates are provided “polished” or “as-fired.” Via fill conductor metals of gold, silver, or copper are available. Via diameters range from 75 to 500 micron on specified pitches. Microplex has developed an ultra reliable hermetic hole fill process, hermetic hole fill, for ceramic thin film circuits, using gold, silver or copper based, hole fill materials. We also provide copper fill with gold caps on the surface and silver fill with gold caps on the surface for customers who need to process directly on gold. This still provides a significant cost saving compared to a total gold hole fill process. The hole fill process also applies to slots and other interconnect shapes that can be laser machined. Eliminates or reduces the number of wire bonds required in assembly. Allows for a conversion to an SMT design for thin film components that presently use wire bonds on top pads. Hermetic hole fill has reliable and rugged construction, with superior adhesion to the hole and slot sidewall, compared to plated hole plugs. Eliminates the problem of hole plugs falling out of the hole. This process results in improved yields and increased profitability. Some customers supply us with polished ceramic plates with drilled holes. We process the plates and planarize the bumps to the surface of the ceramic and ship the plates back. If additional kiss polishing is needed or desired, we can have that done or the customer can take responsibility for the kiss polishing. We also do the complete job, from procuring the polished ceramic plates, to the kiss polishing. Delivery is two weeks after receipt of ceramic with drilled holes. The increased demand for ever-higher circuit speed, performance and density has led to the need to pattern both front and back surfaces of ceramic. To accomplish this level of complexity it is necessary to laser drill through the ceramic and metallize the holes to achieve front to back continuity. In the past the front to back continuity was achieved by sequentially coating the sidewalls of the laser-machined holes to fill the hole. More recently materials have become available that permit total hole fill with gold and silver bearing materials. Unfortunately two problems have occurred when using this technique to fill holes. Cratering around the holes can occur during rapid heat up during processing and photoresist bubbling can occur during the bake step in the etch process. Using proprietary materials Microplex has successfully eliminated both of these anomalies and can now fill holes with gold, silver or copper on varied hole sizes on ceramic. 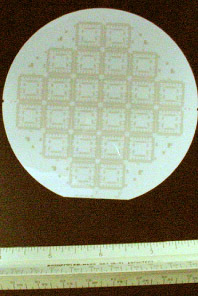 In addition, polishing techniques have been developed which permit polishing to a 2 (two) microinch or better finish meeting the high surface finish requirements of thin film. 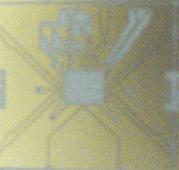 Additional complexity of the thin film circuits is possible when the hermetic seal option is added to the through hole vias. When the holes are hermetically sealed it is possible to create a hermetic package with a glassed or soldered ring frame. The package is completed with the addition of leads or a ball grid array is fabricated.